"Cheap Thrills" is a song by Australian singer Sia from her seventh studio album, This Is Acting (2016). It was written by Sia and Greg Kurstin, while solely produced by Kurstin. An official remix version of "Cheap Thrills" features vocals by Jamaican performer Sean Paul and was made available for digital download on 11 February 2016 as the album's second single. This version was nominated for the Grammy Award for Best Pop Duo/Group Performance. The song is a "bouncy", "reggae-tinged" synthpop song that incorporates "a constant tropical beat and electropop-style synth layers". Paul added his own lyrics to the remix of the song. 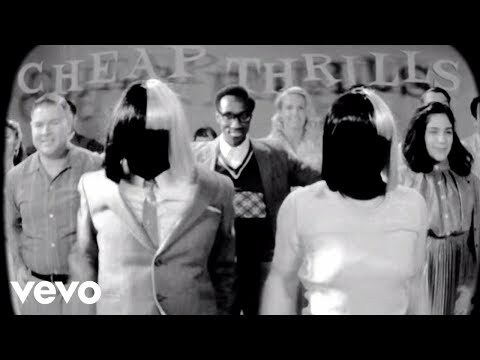 In the United States, "Cheap Thrills" became Sia's first No. 1 on the Billboard Hot 100, and Paul's first since "Temperature" in 2006; it also topped the national Mainstream Top 40 and Radio Songs charts. Among other countries, it also reached the top position in France, Germany, Canada, Italy and Slovenia whilst going top ten in Australia. In the United Kingdom, the song reached number two on the UK Singles Chart. At the APRA Music Awards of 2018 it won Most Played Australian Work Overseas for the song's writers Sia and Kurstin. "Cheap Thrills" was written by Sia and Greg Kurstin, and produced by Kurstin. It was originally intended to be performed by Rihanna for her album Anti (2016), but was rejected. It is a "bouncy", "reggae-tinged" synthpop and dancehall song. The song features "a constant tropical beat and electropop-style synth layers". The remix of the track features a toast from Jamaican reggae recording artist Sean Paul. "Cheap Thrills" is written in common time in F♯ minor. The vocal range in the song spans an octave, from B3 to B4.